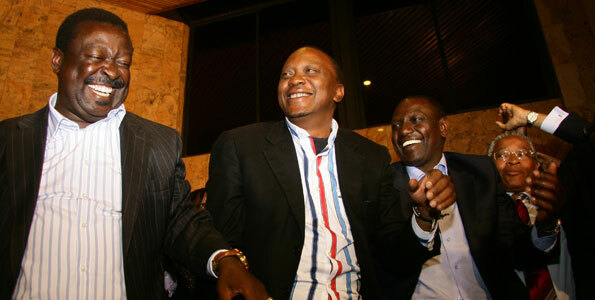 Why Did Uhuru Change His Mind About Mudavadi? In Why Did Uhuru Change His Mind About Mudavadi?, published in the Star on Saturday, I provide analysis as well as reporting based on my credible sources why Uhuru reneged his deal with Mudavadi last month and made the latter not only appear clueless or naive at best in the art of politics, the Uhuru snub confirmed what I had earlier blogged in Political Eulogy of Musalia Mudavadi and reaffirmed in Mudavadi Has Confirmed Yet Again He’s A Politically Dead Man Walking. Not to pat myself on the back but simply reminding those unaware, yours truly was the first one to break the news about the now reneged deal between Uhuru and Mudavadi the night before the Kenya media reported on it and to those who ever question my precision in blogging and analysis, the two blogs about Mudavadi above should tell you I don’t take my blogging lightly but provide precision analysis based on facts and information either publicly known or in some cases based on my own sourcing. The point being, when I say those in denial better get used to saying His Excellency President Raila Amolo Odinga or get used to hearing those majestic words for years to come, I am not joking or saying things for the sake of saying them; I mean that and as I have been proven over and over to be right on these things, this too shall be proven to have been an accurate assessment when Raila is sworn as our next president. My confidence in saying this is not based on some secret plan I know to install Raila as our president watu wapende wasipende but simply analyzing events as I have throughout the time I have been blogging on this and reaching this conclusion as you can read about elsewhere on my blog. Now, that’s not to say the work is done or that Raila cruises to the presidency but simply to say barring the very unusual and impossible to predict at this time, Raila is headed to State House as he and Cord start on the final push to get them there. If what happened in Kisii is any indication, it’s the fact that the hard work is starting to pay dividends Raila and Cord need only make sure there is no mishap along the way for the enemies are lurking to exploit even the slightest of a mishap. We cannot give them that pleasure. It also means Raila and Cord must also be vigilant for much as they run a tightly managed campaign, when it clearly sets in for the other side this thing is Raila and Cord’s to lose, never rule our their ability to go for a Hail Mary pass to try and score an undeserved touchdown merely out of desperation. That, I am confident, Raila and Cord are fully keeping an eye but it behooves all of us who love and/or care about our beloved country to be on a look-out as well and let them know no mischief this time around.